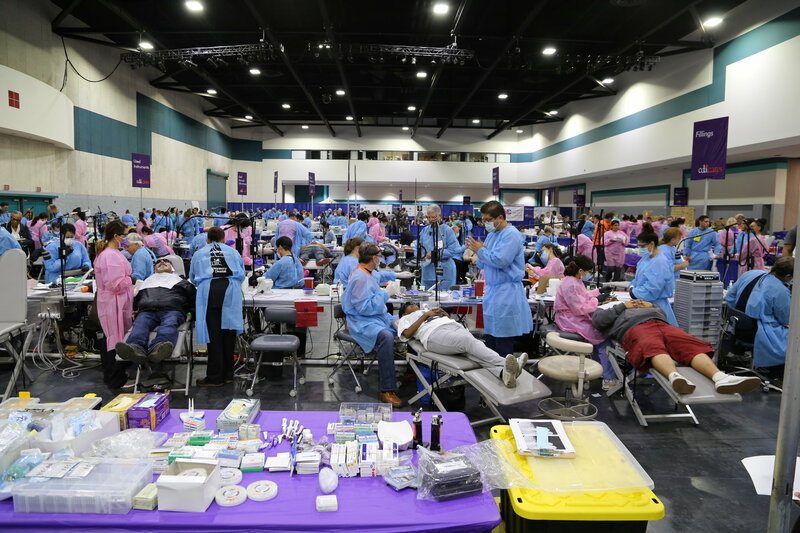 Sacramento, CA (THE WIRE PRESS) – The California Dental Association Foundation’s volunteer dental clinic, CDA Cares, provided $1.5 million in charitable dental services to 1,884 people during the April 16-17 event at the Ventura County Fairgrounds. In addition to providing dental services at no charge to Californians who experience barriers to care, CDA Cares educates the public and policymakers about the importance of good oral health and the need for an adequately funded dental safety net, which includes a well-functioning Denti-Cal program. While final numbers are still being tallied, preliminary estimates indicate more than 1,600 tooth extractions were necessary at CDA Cares in Ventura – a sad statistic, since dental disease is preventable. During the two-day event, dentists and dental professionals provided 11,583 dental procedures, including fillings, extractions, cleanings and oral health education. Volunteer technicians in the clinic’s dental lab area worked to provide 188 complete and partial dentures and repairs. More than 1,400 volunteers donated their time and services at the event, including 750 health professionals – dentists, dental hygienists, dental assistants, nurses and lab technicians – as well as hundreds of community volunteers who assisted with registration, translation, data entry and escorting patients. The California Dental Association Foundation is planning another CDA Cares event this year in Stockton Oct. 15-16. For information about CDA Cares or to register to volunteer, visit cdafoundation.org. The CDA Foundation was formed as the philanthropic arm of the California Dental Association in 2001 with the mission to improve the oral health of all Californians by supporting the dental health profession in its efforts to meet community needs. The CDA Foundation provides grants and scholarships to dental students and professionals, promotes oral health prevention and education, and holds dental clinics around the state that provide dental care at no charge to Californians in need.